Andile is one of the latest additions to the Abalimi farmer network. He has been with Abalimi and Harvest of Hope since April 2016. Back in Eastern Cape his father has a farm with livestock, mainly cattle. One day when visiting some friends in Khayelitsha, Andile passed by the Masithobelane Garden and spoke with the people working there. He was impressed by the capacity of the garden. They exchanged contact details and in December 2015 they called him and invited Andile to join their garden. Since then Andile is responsible for all the admin. Furthermore he is checking the quality of the soil and the produce that comes out of it. 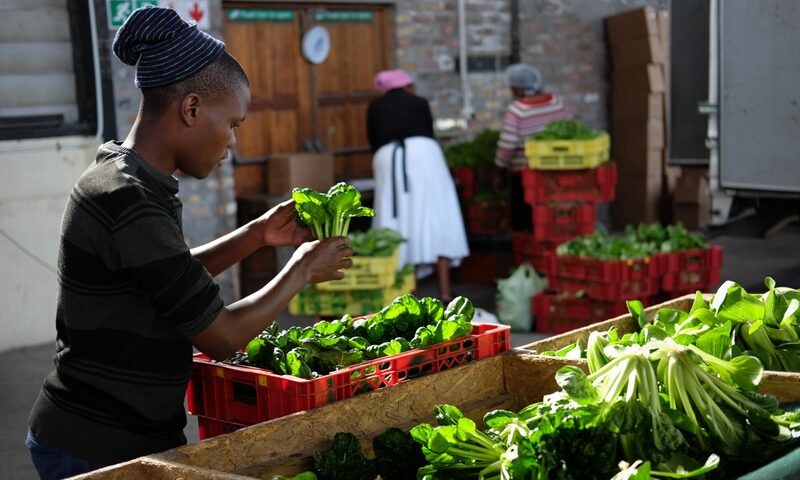 He believes that vegetables grown using organic methods are “a kind of healthcare.” Andile has learned a lot about work ethic from the elderly farmers. “But soil quality is poor. We still lack electricity and the biggest challenge is vandalism and theft”, he says. Besides gardening, Andile is a Tuesday Garden Tour leader for Abalimi and is a member of VUFA (Vukuzenzela Urban Farmers Association). In future he wants to do philanthropic work, be an entrepreneur, travel the world and own a farm that is self sustaining. “You can be a farmer who does more than just producing crops”, he says.